MooSFV is a freeware CRC and MD5 creation / verification program for Win 9x/NT/2000/XP written in C/C++. MooSFV currently can verify and create both SFV files (CRC/32), MD5SUM files (Message-Digest 5), and MD5M3U files (MD5 M3U playlists). This program was built primarily because I didn't like how WinSFV would verify sfv files - I would spend way too many clicks/keystrokes just to verify my files. Why 1.84? Fixed some submitted bugs and tweaked my MooSFV email address. You wouldn't believe how much virus spam I get in my moosfv mailbox because I left it in the readme file :/. 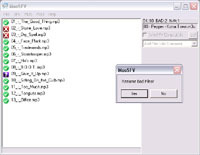 As for the other features in v1.8, they include drag and drop SFV verification, the optional registration of the .sfv filetype, new md5m3u filetype, new verification icons, select verify for all filetypes, and the ability to add file information comments to sfv and m3u files (scene-like file size / date / name commenting). Other small changes are listed in the readme. MooSFV is no longer in development. The source code fell in a hole somewhere over the years, or perhaps has been eaten by a grue. It may be on a backup CD somewhere, but anyway it's lead a good software life. RIP MooSFV :). Say you're downloading a piece of MooSFV literature from an ftp server that happens to be broken up into thirty 15 megabyte rar files (people love reading large quantities of MooSFV literature!). Grab the sfv file first and open it up using Select Verify. Keep it running in the background and as each file comes down, highlight it and hit the Go! button. If you come up with an crc error, requeue up the bad file in your ftp and re-verify it when it comes down. Ahh, nice and efficient :). I'm updating this program and website whenever I have info so check back later (Hit Control-D to bookmark) a newer version may be out when you return.